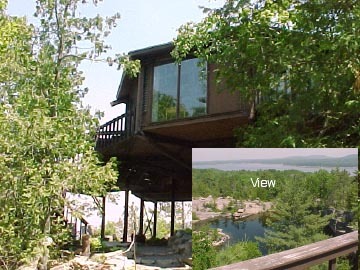 DESCRIPTION: Octagonal home of wood and glass set above a private quarry pond with views of Somes Sound and the mountains. LAYOUT: FIRST LEVEL: Play room with tv, sitting area w/ tv & views. Bunk bed (double bed on the bottom). Washer & Dryer. Deck w/ kids toys. Full bath. Bedroom with a double bed and great quarry views. SECOND LEVEL: Sitting room w/ sleep couch, living /dining area with quarry & mountain views, kitchen/eating area w/back deck, bedroom w/queen bed, bedroom w/ 2 twin beds. Bath w/ Japanese soak tub and shower. HEAT **NOTE: There is NO central heat. There are portable radiators and a propane heater upstairs. SPECIAL CONDITIONS: There are many stairs - not suitable for small children. There is also an "out" building further on property called the "Wee Hoose" which has 2 twin beds. Please be advised the "main" living area for this portion is a separate building, which offers a reading room, full bath, small living room w/ a double sleep sofa, kitchenette w/ microwave, toaster oven, coffee maker & mini frig. 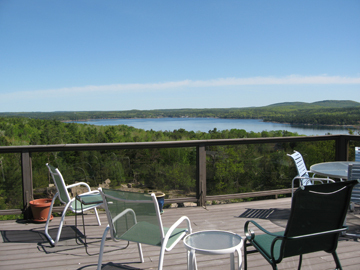 Inquire for availability & rates.